When we initially put together our stories for our screenplays, we typically think about all of our major story beats, jotting them down on notecards or writing bulletpoints in outlines. Everything looks great on our whiteboards or corkboards or cinema displays and we're ready to dive into the screenplay itself. We come to the end of our first scene and realize something is missing. Transitions are the glue that holds our screenplays together, the peanut butter between our scene-size crackers, the chewed-up gum in our MacGyver writing contraptions (alright, I'm trying too hard here). Without transitions, we're left with a bunch of scenes and no cohesive story. On a recent episode of the Scriptnotes podcast, John August and Craig Mazin offer the following five tips on screenplay transitions to help you keep the reader and the viewer engaged in your story. 1. "Don't write directions in your screenplay" is bad advice. I find that [directors] tend to appreciate that you’ve written with transitions in mind because it’s really important to them. And, frankly, if you don’t write with transitions in mind, some directors aren’t going to notice and they’re just going to shoot what you wrote and then it won’t connect. Transitions are a super important part of moving from one scene to the next so you don’t feel like you’re just dragging your feet through a swamp of story, but rather being propelled forward through it. 2. Transitions are much more than the screenplay element "CUT TO:" (which is rarely used). John August clarifies for his listeners that their discussion about transitions isn't really about the Transition screenplay element (i.e. "CUT TO:", "CROSSFADE TO:", etc.). Those screenplay elements are used very rarely in scripts nowadays, and usually CUT TO: is only used when the screenwriter is making a hard cut between scenes and wants to draw the reader's attention to the jump in space and time across the cut. Instead, August wants his listeners to think about transitions as how scenes flow from one to the next in the screenplay so readers understand why they are moving from one scene at a particular moment and entering the next scene at another particular moment. 3. Here are five examples of scene transitions to help your story flow through your screenplay. 4. Save big transitions for key moments in your screenplay. August reveals that the reality for most people in the industry who read lots of screenplays, including himself, is readers tend to skip over sluglines as they read through the heart of a screenplay and go straight to the first line of action or dialogue in a scene. With this in mind, screenwriters should use their big transitions for key moments in their screenplays when they really need the readers to notice the transitions in their stories. 5. Find your own transitions that work for your style. Mazin acknowledges that the examples of transitions they provided above are generic for the purposes of the discussion on the podcast and encourages writers to find transitions that work the best for their styles. Moreover, writers need to make sure they aren't simply lining up a bunch scenes that bump into each other with nothing creating a natural flow between the scenes to connect the story. When we use notecards or outlines to beat out a story, we typically focus on individual scenes and not necessarily the connective tissue between those scenes. This is why transitions become so important when we move to the screenplay stage of our writing process so all of our story beats mesh into a cohesive and compelling story for the reader and ultimately the viewer. 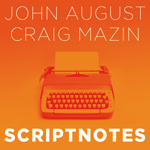 You can listen to the full conversation between John August and Craig Mazin on screenplay transitions in Episode 89 of the Scriptnotes podcast. If you don't already subscribe to Scriptnotes, stop what you're doing right now and subscribe. Scriptnotes is like a weekly master class in screenwriting and it's absolutely free. Your screenwriting will improve just by listening to Scriptnotes on a regular basis. What kind of transitions do you use to pull readers through the story of your screenplays? What are some of your favorite transitions in film and why do you find them so effective? Share your thoughts with us in the Comments. Great post - thanks Christopher! a slightly tangential but essential lesson that Trey Parker and Matt Stone swear by is the "But & Therefore" rule, where you go through your story and after every beat make sure you can say "but" or "therefore" (ie, this happens THEREFORE that happens. Or, he/she did this, BUT then that happened, THEREFORE he/she then did this). The key is to avoid using "and then" (ie - this happened and then that happened and then another thing happened) - it's all about giving your story causality which is what a story is essentially built on. It's an exteremely helpful practice to force yourself to do regularly. I have to disagree with point 1 and some of 3. Whenever the writer draws attention to the production, s/he distracts from the story. Unless you are writing to make the script yourself or know it's going straight to a director, you are writing for a reader. Readers don't want to read camera direction or transitions; it interrupts story flow. If the director is interested in how you see the movie, they will ask and you will collaborate. Yes, please disagree with two award-winning screenwriters that actually works in hollywood. It will hopefully work out for you. I have a question, how to drive a transition scene if the story is on the same location and the conversation is ended between two character, how ever one of the character is going to converse with the third character after some time when the conversation between the first and second character is finished. also the movement of the story is going to be in completely different context when the second character is going to converse with the third character on the same location.